Nothing feels like a Sunday morning more than slowly waking up in your warm and cozy bed and then heading downstairs to create a full and hearty breakfast – that is unless you have kids, then I at least hope that you woke up and didn’t step on a lego getting out of bed. Either way, breakfast is a time to come together with loved ones and fuel up before you go about your day. It is a key meal in regards to jump starting your metabolism and providing your body with the fuel it needs to function efficiently. However, what you may NOT know is that many common breakfast choices are packed with ingredients that can leave you feeling too full, bloated, gassy and lethargic. While eating boxed pancake mix may be quick and easy, that powder is made of bleached and enriched flour and partially hydrogenated oil. Not to mention that it is also loaded with trans-fat, which many doctors say is the worst type of fat to eat – YUCK! But don’t worry, I have a natural, sweet and savory Sweet Potato Pancake recipe that will be be enjoyable and easy like Sunday morning. Top it off with some Breakfast Greens to give your day a healthy jumpstart! Mix together all the pancake ingredients (except coconut oil) and mix until a batter forms (use a handheld blender or mash together with a fork). Heat coconut oil in a pan over medium heat. Pour ¼ cup of the pancake batter into the pan and cook until bubbles start to form. Flip the pancake and cook 1 minute more OR until fully cooked. 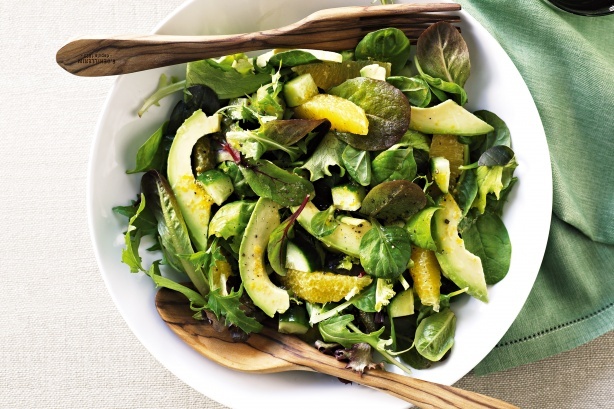 Mix together the diced avocado, rocket and juice of half a lemon. Place on top of the Sweet Potato Pancakes and drizzle with yogurt and herbs. Who do you know that would LOVE this recipe? SHARE it with them now!